Built in 2009, Ocean Villa is a 4-bedroom, 3.5-bathroom accommodation located within the Wyndham Rio Mar Beach Resort, making this great for up to four couples or a family. The resort offers a children’s pool, a kid’s club program, and even a playground and arcade for those with kids. For adults, the casino, live entertainment, shopping boutiques, and two golf courses are also available. Don’t forget the sailing, snorkeling, deep-sea diving, and other water activities the beaches and various pools at the resort have. And just a short distance away is the El Yunque tropical forest. 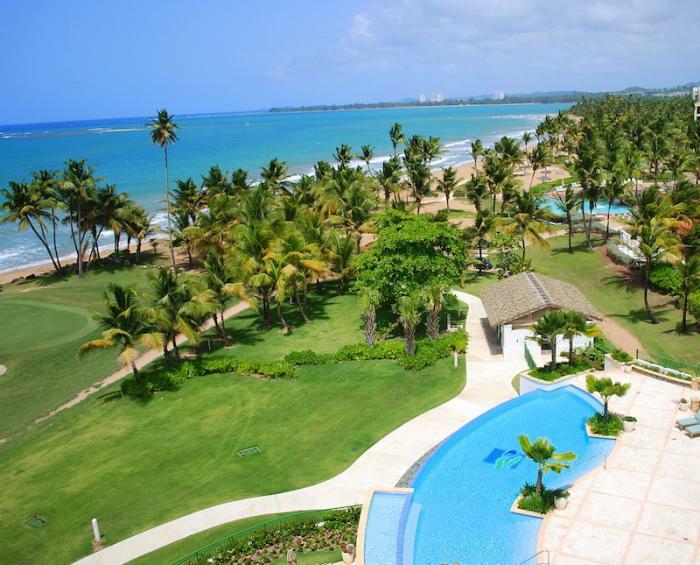 4-bedroom oceanfront villa at the Wyndham Rio Mar Resort. There are plasma screen TVs in every bedroom plus the living room. The terrace seats 8 comfortably at 2 patio tables. The resort offers many activities for the family to enjoy which include a full service spa, 12 restaurants, two 18-hole golf courses-Greg Norman’s River Course and Tom and George Fazio’s Ocean Course, 13 har-Tru courts operated by Peter Burwash International, bicycle trails, scuba diving, sailing/rentals, plenty of water sports, hiking, casino, bar/cocktail lounge, live entertainment, beauty salon, complete fitness center, business center, concierge, shopping boutiques, laundry, babysitting referral, kid’s club program, children’s pool, playground area, and arcade/game room. Nearby, you’ll find VCR/DVD rentals, a large and modern grocery store (small grocery store is 1.5 miles away. Large grocery store is 3.5 miles away), drug store, and local dining options. Also, there are many highlights near the resort to explore including the cascading waterfalls and the rivers of El Yunque tropical forest, horseback riding at the foothills of the El Yunque and the beach, Bioluminescent Bay night kayak trip, catamaran snorkeling excursion, Old San Juan tour, deep-sea fishing, and the Camuy caves. The villa is stocked with a “survival kit” including soaps (for showers and sinks), shampoo, toilet paper in each bathroom, and a roll of paper towels in the kitchen. When these items are consumed and maid service has not been requested, it is the guest’s responsibility to self-cater replacement items. You are allowed to use the facilities of both the resort and Wyndham Hotel. You must pay for everything consumed with either cash or credit card (there are no charge accounts) and you also receive the same special rates for golf and tennis as guests of the hotel do. A villa chauffer is available to pick you up at the airport and transport you to the villa for $75 (1 - 4 persons by van; $20/per person over 4) or $120 Lincoln Town Car (1 - 2 or 3 persons - with light luggage and no golf clubs). If you have rented a car, you will go directly to your rental car agency counter at the airport, where you will be provided with a villa packet containing keys and directions to the villa. Taxis fares from the airport range from $75 - $120 for transportation to the villa. Maid service prior to arrival and upon departure. All ages welcome - Babysitting referrals, Kids' Club program, Children's Pool, Playground Area, Arcade/Game Room located on the resort property. Daily maid service $100/day or $450/week additional; Crib rental $20/night; Roll away beds $25/night; Cook available upon request. Rio Mar is great! We basically had a private beach and pool for a week. The resort is within walking distance, and had allot to offer. We played golf and tennis, ate at many of the resort restaurants and did several excursions from the resort - but we could escape from the resort and go back into our own little world at our villa. LOVED IT! Her personal recommendations were great. Having someone tell me what to do because they have actually been there is so helpful! The tip to stop at the grocery store worked great for us!